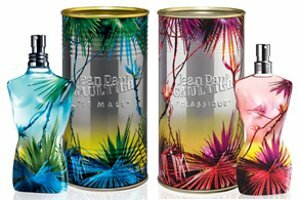 Jean Paul Gaultier has launched the annual limited edition summer versions of Le Mâle and Classique for Summer 2012. Le Mâle Summer ~ "Le Male is awash in the heat of the summer sun, surrounded with tropical foliage, wild lianas and exotic flowers." With notes of lavender, mint, cardamom, grass, leaves, vanilla, musk and sandalwood. $62 for 125 ml Eau de Toilette. Classique Summer ~ "Inspired by Jean Paul Gaultier's Spring-Summer 2011 Collection, "Classique" is bathed in the heat of the summer sun, surrounded with tropical foliage, wild lianas and exotic flowers which enhance her sensual curves." With notes of mandarin, lemon, rose, orange blossom, jasmine, ylang-ylang, lily, iris, vanilla, musk and amber. $67 for 100 ml Eau de Toilette. Jean Paul Gaultier Le Mâle Summer and Classique Summer can be found now at Macy's. These are kind of cute. My fiance has the 2010 summer version of Le Male and I really like it on him. Honestly, though, it just smells like a lighter version of the original Le Male. I can never tell much difference in the masculine summer flankers for Le Male. I cannot remember if they change the juice for the summer version from year to year — it is too hard to keep track of all these summer versions. that summer pattern on these bottles reminds me of an Avatar world, anyone gets that impression too? I *still* have not seen Avatar. We own the DVD (son is a big fan) and I must get around to it! I pretty much always want these, and pretty much never see them. I wanted that Maori Tattoo edition like crazy – never saw it. Sigh. Ditto — I never see them in person. I saw them in the flesh at a trade fair last week – love the colours, the bottles are SO pretty. Does anybody know if this summer version is, like the other years before, also free of alcohol? I searched the web but found no hint on this… Even on the homepage of JPG. If anybody already owns the 2012 summer edition: could you take a short look on the packaging and let us know? Thanks a lot! I’m sorry but I don’t know…hopefully someone else will chime in. Now I can answer my own question ;-). It is with alcohol, so no “real” version d’ete but a summery variant of the Classique theme in a normal EdT concentration. Nevertheless a very good alternative for Classique lovers for usage in hot weather. The rosy and mandarine opening is really refreshing and in the dry-down you have the classic classique, but very close to the skin and without hitting anybody with the strong vanilla base of the regular EdT. I “had to” buy it after my small body lotion (wich was a gift not for sale) is empty and I’m kind of addicted to the smell of it. For me it is the perfect summer scent at the moment. Eagerly awaiting the 2013 version.